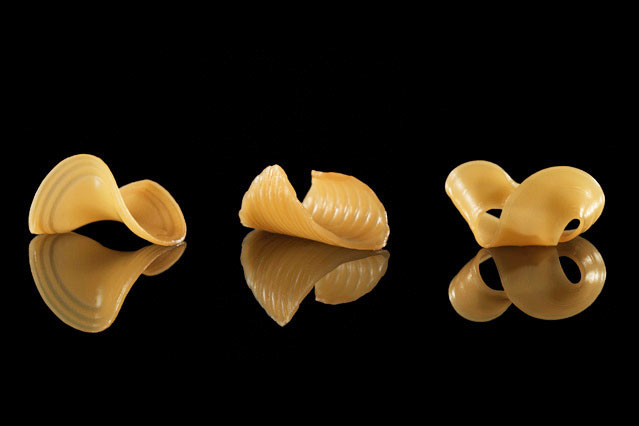 A new research project from the Massachusetts Institute of Technology’s Tangible Media Group combines 3D printing, molecular gastronomy and macaroni. According to MIT News, researchers Wen Wang and Lining Yao have engineered flat sheets of gelatin and starch into shape-shifting noodles that react and fold when exposed to water. While Yao’s goal of one day creating a self-folding dumpling is still out of reach for now, the research team thinks their breakthrough could help reduce food shipping costs and lead to new trends in fine dining.